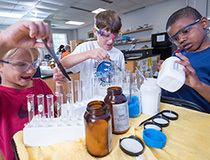 A writer, a teacher, a scientist – no matter your child’s future career aspirations, UNCW summer camps offer youth of all ages and interests opportunities to learn and grow in a fun, organized way. Below is a comprehensive list of camps being held on UNCW’s campus throughout the summer months. These fun-filled sessions improve critical thinking skills and ignite the scientific imagination. Forensics: Port City CSI Camp 1 to 5 p.m.
Criminal Solutions Forensics Camp 1 to 5 p.m. Bond Girls Forensics Camp 1 to 5 p.m. Discounts are available. Additional information and registration available online. UNCW Engineering Expectations opens young minds to the world of science, technology, engineering and mathematics. For more information and to view all of the summer options, visit the Engineering Expectations website. The Junior Seahawk Academy is designed for students ages 10-14 from economically disadvantaged and underrepresented populations to develop interests in STEM, health care and careers in teacher education. Participants will learn and explore STEM concepts using technology and design creative service projects. The session will be held June 25-29 (8:30 a.m. to 12:30 p.m.). Application information can be found online. UNCW has the honor of being the state’s coastal university. What better place for your child to be exposed to cutting-edge ocean research than through MarineQuest summer programs? Choose from more than 30 thematic programs for ages 4-17. For complete information, visit the MarineQuest website. Campers will learn the art of opera props, make-up, costumes, scenery and musical preparation in this week-long experience (June 25-June 30) for fifth through tenth graders. Cost is $175 (limited number of need-based scholarships are available). Details and registration here. A variety of athletic camps will be held on the UNCW campus this summer. Sports include boy’s soccer, baseball, tennis, volleyball, girl’s and boy’s basketball, softball and swimming. Please note, these camps are not supported, controlled or supervised by UNCW and are under the sole supervision, control and sponsorship of the designated camp directors. UNCW CMA faculty and student teachers will lead classes in ensembles; music theory and history; piano and strings to spark children's musical interests and help develop their skills. The camp will be held June 11-15 and is open for youth grades K-12. Scholarships are available for middle and high school students by teacher recommendation. For more information, contact Danijela Zezelj-Gualdi. The Young Writers Workshop is an annual five-day camp (July 10-July 14) for high school students to study the craft of writing. The workshop is organized and operated by UNCW's esteemed department of creative writing. Participants have the opportunity to study with published authors, faculty members and graduate students from the department's Master of Fine Arts program. Participants room in UNCW’s residence halls and dine in Wagoner Hall, supervised by graduate student counselors. Counselors are available at all times for unstructured interaction, assistance with writing projects and moral support. The workshop fee covers tuition, housing and three meals per day. To find out more and register, click here. From July 8-13, high school students will work with faculty, entrepreneurs and current UNCW students to learn the basics of entrepreneurship and business in a fun environment. The program provides an introduction to entrepreneurship and “hands-on” project development in teams, culminating with team project presentations to parents, UNCW guests and local business leaders. This year’s program will focus on “Construction: Beyond Brick and Mortar.” The program is limited to 30 students and the cost is $99. Apply by June 12.